There are some leaders in the health club and fitness industry I really admire. The admiration might come from their accomplishments; who they are as people; or because of their generosity. Few stick out for all three reasons and that is why I was delighted to have some face time with Chuck Runyon, co-founder of Anytime Fitness, at IHRSA this year because he is someone I admire for all three. Chuck Runyon has an almost "rebellion" like style . His active participation on twitter and of course his at times outspoken views are appealing to me. He's someone who likes to shake things up. Whether its been as part of the Public Policy Council of IHRSA or via his writings or tweets; you gotta love the guy's style. “Bi-furcation” is a well documented trend which author and consumer researcher Michael Silverstein defined and which a wide number of researchers have explored. Economic polarization of the market has been coined by Citigroup as the Consumer Hourglass Theory. For various economic reasons, the upper and lower classes bulge while the middle class is squeezed. The co-founder and former CEO of Planet Fitness, Mike Grondahl joked with me about the term at Club Industry a few years ago, since I attributed the success of Planet Fitness to the trend. Chuck obviously felt that it wasn’t the only driver of market changes for health clubs. During IHRSA Chuck, along with my partner Robert Dyer, discussed the topic and I explained that “bifurcation” is a real consumer trend that is driving consumers up the value chain or down it. 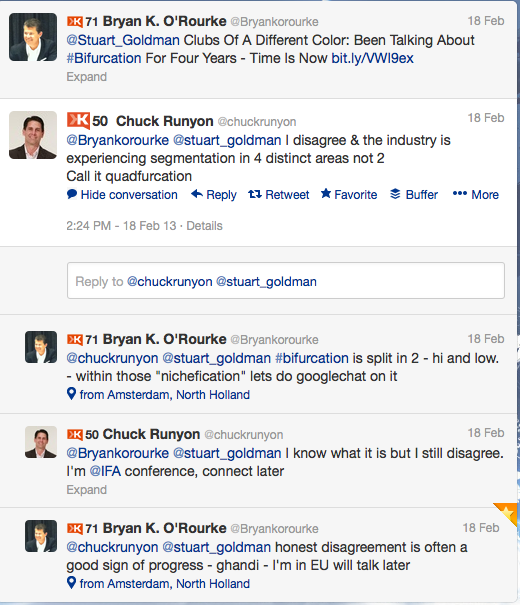 I also shared with Chuck my “S Curve” graphic showing how fragmentation is and will happen in response to this trend. However, as Chuck pointed out, there are other variables like convenience and economic dynamics that are creating different market responses. His case in point is my partners use of an Anytime Fitness outside of Fort Worth at $39 per month or the micro-gym / studio trend. He is right in that bifurcation alone is not the only driver to facility models. That is helping his company maintain higher membership rates than competing low cost chains, mostly because of the convenience factor. Chuck took out a pad of paper and began segmenting the industry into four quadrants to include: High End Big Box, Low Cost, Convenience and Studio (see the original graph in the intro photo). He also drew the future of the industry into quadrants of Virtual, Nutrition (in home), Employer Medical (insurance) and Behavioral Motivation. I’ve included the drawings which I asked Chuck if I could post (notice the initials on the second drawing). He kindly agreed. During my presentation at IHRSA on Trends Impacting The Health Club Industry I shared some graphics (not the originals) and mentioned Chuck’s views. I agree with many of them but maintain that bi-furcation is a trend driving consumption patterns of health clubs; but to Chuck’s point it isn’t the only one. Convenience is a big driver and part of Anytime’s secret sauce. After our meeting Chuck tweeted, “thx & next decade in fitness industry will b most competitive, most disruptive & most opportunistic! #IHRSA2013 “. On that thought we completely agree. Chuck thanks for sharing your views and taking time. I appreciate your helping to expand the dialogue on where the industry is headed and yes Chuck 1 Bryan 0 is ok by me, although on our talk I wasn't keeping score ;). So what do you think ? How do you see the health club industry growing ? Where are the greatest opportunities and do you agree with Chuck's views ? Please let me know !